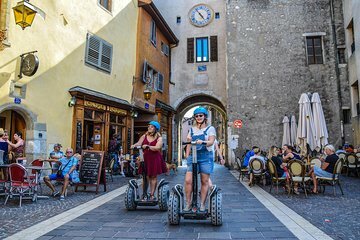 Segway tours offer a fun way to discover Annecy and this extended 2-hour tour lets you explore even further. Glide around the waterfront promenades and beautiful gardens of Annecy Lake, see the sights of the Old Town, and admire views of the Imperial Palace, then continue around the scenic canal ways and along the Thiou River. Our guide, Vincent, was very patient with us as we were new to riding the Segways. He was informative on the tour and the equipment was good. There was a safety briefing to begin and everything ran to time. Basic knowledge of French would be useful to make the most of the commentary.